We have begun our journey back to Camano and the end of our summer adventure. At the moment we're in Deer Harbor in the thick of the long-awaited wood stove installation. We'll be here the rest of the week with the boat torn apart while the last sunny sailing days of summer slip away. And then more hole drilling awaits us in Anacortes next week. 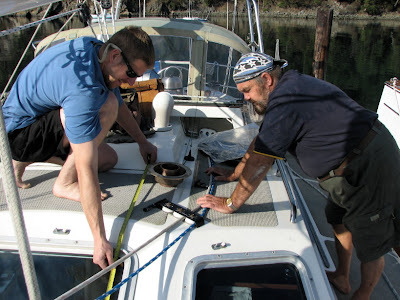 Gosh, drilling holes in your boat causes tension. Luckily, our landlubber friends, Mariah and David, generously entertained us with vittles and hot tubbing while ashore last night. If we're fortunate we might even relieve some tension with a musical frolic before the week is through. Meanwhile Andrew of Navigator Stove Works and Jeff work away at a relatively complex stove installation. They're an efficient team working out both the math and the functionality of how, where and why to safely build a heavy burning object into the middle of a cabin that will someday roll on the high seas. Add Steve's abundant brain power to the mix and my own random injections, and we've had some lively discussion and come up with some brilliant solutions. It may be a big old mess, but it has been fun. So far. And we inch, inch, ever toward sufficiency. What is sufficient? What is simply survival? What is luxury? Many layers of meaning unfold from these words for me. I've been thinking about this idea of sufficiency. A lot. I recognize that Nomadness isn't yet ready to provide what we need to be truly independent and self-sufficient. With the financial collapse of our monstrous top-heavy capitalist system sending many, if not most, Americans into a frenzy to shore up their lives, my first associations with sufficiency relate to material wealth. I can honestly say that I am thankful I have very little to lose in this regard. 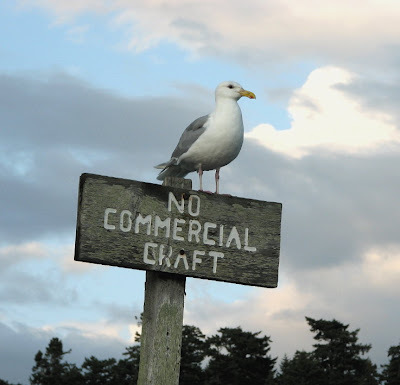 I'm with the gulls on this one. Seriously, though, the degree to which people have life skills and the ability to be self sufficient will determine who gets hit hardest and who rolls with the punches. During the Great Depression, the general population may have been better prepared to deal with hardships. People still knew how to grow food, make stuff, and they weren't afraid to offer or ask their neighbors for a helping hand. Maybe I romanticize it. Maybe. But I do know that stuff (things, tools, clothing, etc) was made to last back then. I wonder what will happen in five or ten years when everything breaks, the dumps overflow with appliances, China has cut us off due to our debts, and very few know how to make what they need. What will be of value then? So what does self sufficiency really mean? Having food, water, a connection to the world, and a place to be? Let's consider the most basic of these first. Water. Just how much water do we need? Do you know how much water you use? I do. On Nomadness the two of us currently use about fifty gallons of fresh water per week for washing, drinking and cooking. We could use half that if we set our minds to it and used more salt water. Fortunately, have a water maker back at the lab, resting at the top of the list of "stuff to install." Can we make water at a rate that will suffice? Where does survival become sufficiency become comfort? It gets blurry. In regards to human connection, what do we truly need? Daily net connections? Phone? Post office? TV, iPods, and radios? Could we survive with weekly connections? Monthly? Could would live without these things entirely? Survive, yes. Would it be sufficient? That's a different question altogether, isn't it? So why not make our own music and stories to share? Somewhere inside me the need for connection intersects my need to create. And what about electricity? How will we provide enough power for our cameras, radios, computers, lights, navigation equipment, and other necessities? Solar and wind harvesting certainly. I look forward to learning from Steve about how these work. He's planning a whole new power management system to give us an abundance of free electrons without relying on diesel. He'll be stripping solar panels from previous projects and, with help from a welder friend, installing them on the stern arch on Nomadness. Sufficiency is hugely complex. And to complicate it all, we have differing of opinions on what is necessary. For the most part, I defer; my needs are quite simple really. Once survival is addressed, I seek human interaction and creativity, documentation of our existence in this moment in history. Those big universal questions rear up. What is important in life? Why are we here? What will I leave behind when I have turned to ash? For me, I suspect it has to with love, the creative force of the universe. Certainly there is more to our collective existence than the depletion of earth's resources and the invention of more thingy-ma-jiggers. Certainly there is value and purpose in myth-making and kindness. So here lies the true heart of the matter. The crux is this: sufficiency resides in knowing that one can take care oneself. Not only financially, or physically, but in psychological and spiritual well being, which requires that one's Being is well. Am I self sufficient emotionally? Is my heart independent? Do I need others to validate my sense of purpose in this world? 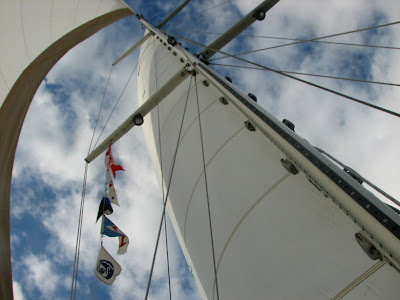 These questions touch on the role of solitude in boat life. Attending to the self in the sweet quiet communion with the waves, the wind and all that floats above and beyond may be the most nourishing food of all. Maybe all we really need is the sense that we are safe and fed, that our lover sleeps quietly below dreaming of turtles, while the sails fill and colorful flags luff in the autumn wind. Maybe that will suffice for this lifetime. Then again maybe we best get the water maker installed and the solar panels up. Oh, and a first draft of something down on paper. And learn another language, and celestial navigation. And let us not forget to love at every opportunity in even the smallest ways. Hang on, this is going to be a wild winter ride for sure.